The 2018 New York Junior Tennis & Learning (NYJTL) Leadership Luncheon will be held on Tuesday, November 6 at 12:00 p.m. at The Pierre. 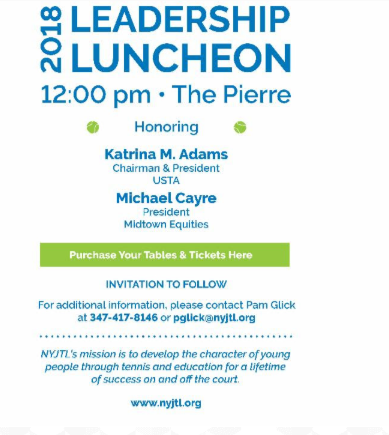 This year's event will honor USTA Chairman and President, Katrina Adams, and Michael Cayre, President of Midtown Equities. For additional information, contact Pam Glick at (347) 417-8146 or pglick@nyjtl.org.